Venue information | DGP - Deutsche Gesellschaft für Pflegewissenschaft e.V. All conference events will take place at abba Hotel Berlin. First of all, a smile and a hearty welcome await you at the abba Berlin hotel – your meeting place right in the heart of the metropolis of Berlin. Here you will be met with a warm, friendly ambience in modern design, our hearty and professional service, as well as a top price-performance ratio. Capable of hosting large or small congresses, seminars, incentive functions or festive balls, variable conference rooms are available for up to 400 delegates in the modern conference & event area. 11 different room combinations of between 75 m² (807 sq. feet) and 480 m² (5,166 sq. feet) are possible. In addition, 8 group rooms can be used for workshops and smaller meetings. All facilities are equipped with the latest conference, information and media technology as well as with free WiFi. 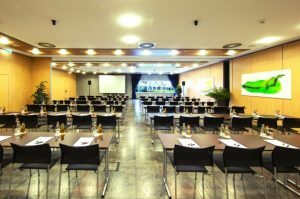 Our focus is on conferences and events for between 30 and 150 people and in this respect, we can proudly look back on many years of experience and satisfied customers. We look forward to welcoming you at the abba Berlin hotel. The hotel offers its guests an exterior private parking in the same building as the hotel to ensure the comfort of its clients. Price: 2 euros per car and hour / 15 euros per car and day. The loading and unloading zone is right in front of the hotel entrance. Further possibilities for loading and unloading of cars and vans is in front of the conference foyer. o Express-train RB 14 direction Nauen.